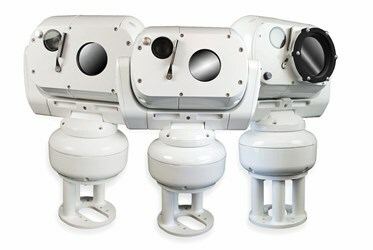 HOOD RIVER, OR – Sierra-Olympic Technologies, supplier of infrared (IR) and thermal imaging components, cameras, and systems solutions for advanced IR imaging applications, introduces the newest models in Silent Sentinel’s Aeron Searcher visible/infrared imaging systems for long-range surveillance. There are now three optional LWIR zoom models. The Aeron Searcher 60 with a15-60mm thermal optic is suitable for wide FOV, near-object detection within 1.5 km. Aeron Searcher 105 offers 3X continuous thermal zoom with a 35-105mm optic and offers human detection at 3 km, and the Aeron Searcher 150 with 50-150mm LWIR zoom is best for long- range imaging. The Aeron Searcher family offers the most flexible imaging performance available in an environmentally-protected, thermal/visible PTZ surveillance system. All models offer simultaneous visible video verification provided by a 36X SD zoom module or a 30X HD zoom module, and excellent human-detection capabilities up to nearly 5 kilometers with the 50-150mm thermal zoom at night. The rugged pan/tilt cameras in the Aeron series provide standard definition (SD) and high-definition (HD) video options with continuous-zoom thermal and visible imaging. The Aeron camera family features 640 x 480 uncooled detectors for LWIR thermal imaging. The thermal sensor uses a proprietary image contrast enhancement (ICE) algorithm to improve the image in low-temperature contrast environments. The Aeron Searcher systems can be mounted upright or inverted; the yoke can be offset to eliminate blind spots throughout the 360 degrees of rotation to provide accurate and reliable day/night operation. Optical encoders for both the pan and tilt axes (with +/- 90 degrees of tilt) ensure highly accurate positioning and repeatability. The units are enclosed in hard anodized aluminum casings, ruggedized for extreme environments and fully rated to IP67. Aeron Searcher systems are Pelco-D compliant, and have been interfaced to numerous popular IP video encoders and VMS systems. For more information on The Aeron Searcher long- range, LWIR/visible PTZ surveillance systems, go to http://www.sierraolympic.com/aeron. Sierra-Olympic and Silent Sentinel have partnered to provide North American customers local sales and services support for Oculus and Aeron products. All cameras and surveillance systems offered for sale online are controlled under Department of Commerce rules. Extensive safeguards are in place to strictly comply with U.S. export laws. Pre-qualified and validated customers can order and receive most in-stock cameras overnight, if desired. To order advanced IR thermal technology cameras and accessories online, go to: www.sierraolympic.com. To learn more about Sierra-Olympic Technologies’ wide array of advanced infrared imaging systems and solutions, please visit: www.sierraolympic.com.